This is the worst gimmick ever, but on Facebook I have listed as favorite music, 26 albums starting with a letter in the alphabet. Whatever, I decided to upload them for friends. So let's start with A. 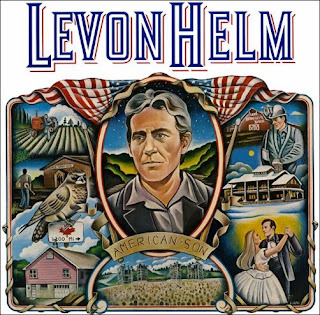 Probably the best solo album from a member of the band, Levon Helm's 1980 masterpiece is one of the true gems of the country-rock sound. The album came to be during Helm's work covering "Blue Moon Of Kentucky" for the soundtrack of Coal Miner's Daughter where he played the father of Loretta Lynn. The song and session went so well with Fred Carter Jr. that they just decided to go ahead and cut an album of other lesser known traditional songs (none are original here). What resulted from these sessions is Levon getting down to what he does best, the more country-oriented sound rather than the funky stuff he was trying to do prior. Tracks like "Violet Eyes" will wrench your heart out, but subsequent songs like "Stay With Me" will get your head bobbing and foot stomping. American Son is the most Band-like album by Helm and just one really fun listen. This version I have uploaded has a couple pops in the sound, but they are hardly noticeable. Enjoy and leave comments.